Caterham High School recognises that all staff and Governors have a full and active part to play in protecting our pupils from harm and that the welfare of our students is our paramount concern. In cases where a child is suspected of being a victim of physical or emotional harm or neglect it is the responsibility of the school Designated Safeguarding Leads to take appropriate action. This may mean monitoring the behaviour of a student or making a referral to an outside agency, such as the Child Protection Agency. Our Designated Safeguarding Lead is Mr É Casey, Assistant Headteacher. 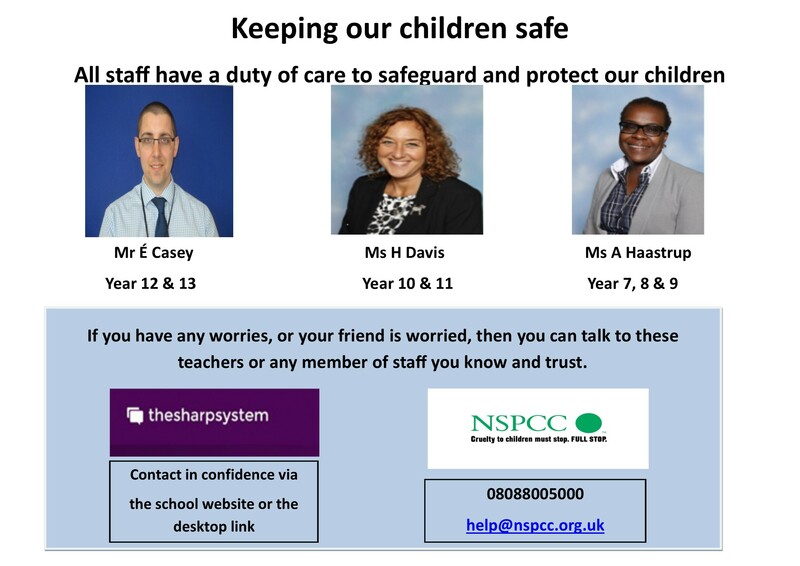 We have two Deputy Designated Safeguarding Leads - Ms H Davis, Deputy Headteacher and Ms A Haastrup, Deputy Headteacher. Full details of the role of the School Designated Safeguarding Leads and schools responsibilities with regard to Safeguarding procedures can be found in the ‘Caterham High School Child Safeguarding Policy’ and Keeping Children Safe in Education 2018 which is available from the school on request, and from the downloads section below. Please contact our Safeguarding team if you have any enquiries.